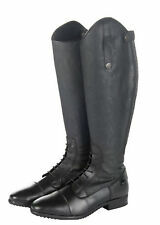 Mountain horse black leather riding boots. Size 6 (40 ). Very good condition . Condition is Used. Dispatched with Royal Mail 2nd Class. Model 6440. Condition is Used. Calf Width 34-37 / Height 49cm. Mountain Horse Superior High Rider Ladies. UK 6.5 / EU 40. An amazing competition boot in premium selected nappa leather with the ShockX™ Advanced Insole. • Integrated tempered steel shank for improved stability while riding and walking. 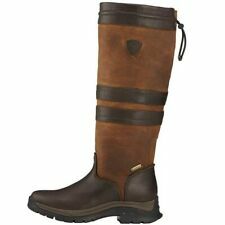 Cavallo long riding boots / field boots. Modell: Atlanta. calf circumference: 36 cm. Hence sad sale of these lovely high quality boots but a great opportunity for you to grab a bargain. Size: UK 6.5 / EU 40. Top Quality Regent Black Leather Riding Boots Leather Upper - Man Made Sole Size shown on boot = UK 6.5 (Approx. EUR 39) In exellent Used Condition. There is no damage to the soles See pictures provided The important measurements for you are: Height of boot from heel (not floor) to top of boot = 44 cms (Approx. 17 inches) Width of calf = 38 cms (Approx. 15 inches) Slim leg Width around ankle = 32 cms (Approx. 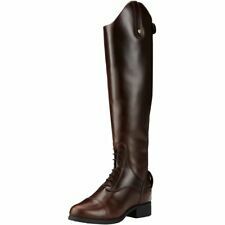 12.5 inches) Regent Boot Style no. 5601M Thanks for your interest any questions please contact me. Mark Todd Long Boots. Size 41 wide women. Brown. Never worn. Size 6.5 Mark Todd Milestone Long boots. Supple brown leather with rubber soles. Never worn, wrong size bought hence sale. These boots do not seem large in the foot. Almost like a size 6.